When the trees on Long Island slowly turn bright shades of red, yellow, and blazing orange, it's time to take the whole family pumpkin picking. The kids will love choosing their own pumpkin straight off the vine. Many Long Island pumpkin farms also offer seasonal fun, such as corn mazes or Halloween events. Here's a sampling of Long Island farms where you can pick your own pumpkins. Included are some that sell already-picked pumpkins. We've arranged them alphabetically by location. Since each year's harvest is different, please call ahead to double-check for the times and days these farms are open to the public. 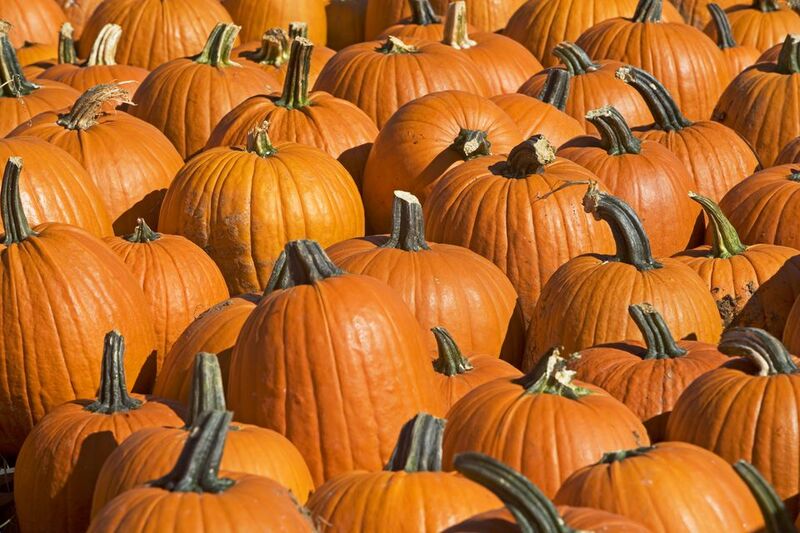 Take the whole family to this 26-acre farm and choose from 18 different varieties of pumpkins. The kids will enjoy picking their own pumpkins straight off the vine. There's free admission and parking and a corn maze. Enjoy roasted corn, apple cider donuts, and a bounce house for the kids. Seasonal fun includes hayrides, pony rides, and more. Spread out over more than 12 acres, Brightwaters Farm offers an annual Fall Harvest Festival. The kids can pick pumpkins, go on pony rides or hayrides, and enjoy inflatable rides. There are farm animals on view and a Little Farmers Playground. Purchase ​freshly baked pies, candy apples, or roasted corn. Come to Fairview Farm's corn maze, created from eight acres of corn growing 10 feet tall. Cutchogue: Greenland Family Farms Inc. Owned and run by the Samolewski family, Greenland Family Farms features hayrides on weekends in October, pumpkin picking and more. Pick your own pumpkins at this family farm in Dix Hills. There's no admission fee to enter the farm. Activities for the family include a hayride, animal train ride, pumpkin bouncy house, and John Deere Trike Play area. There's a selection of mums, ornamental kale, hay, cornstalks, Montauk daisies, and other fall perennials. There are fall and Halloween decorations, and you can also enjoy roasted corn, fresh baked goods, homemade candy apples, and local apple cider. Take the Long Island Expressway to Exit 50 and go one-quarter mile north. This three-acre, organic farm is open from April 1st through November 1st​ and allows you to pick your own pesticide-free pumpkins right off the vine. It's a relaxed place where you won't find crowds as you wander through the organic pumpkin patch. Organics Today Farm doesn't charge admission or parking fees. There are tractor-pulled hayrides for a small fee per person in season. One of Nassau County's only organic farms, Friendly Farms sits on 2.2 acres and you can pick your own pumpkins as well as other fruits and vegetables in season. Attend their annual Fall Festival, where you and the kids can pay for a hayride, enter the Haunted House before and on Halloween, make a scarecrow, paint pumpkins, and more. A pumpkin farm in Huntington? Who knew? Come to the Elwood Pumpkin Farm and pick pumpkins right off the vine. There's no admission charge, but there is a fee for the kids' corn maze (adults will enjoy it, too!) and hayrides. You can also pick your pumpkins during the week, but you'll have to call in advance to make an appointment. Bring the kids to Schmitt's Family Farm for the daytime corn maze and the children's daytime haunted mansion. There's a pumpkin playground, pick your own pumpkins, pony rides, a 30-foot slide, and free hayrides. White Post Farms features an annual fall festival that includes pumpkin picking. There is an admission fee on festival weekends. This includes unlimited use of their slides and bouncers. There are also toddler bouncers for children under 36". Pony rides, train rides, and pumpkins are available for an extra fee. In the fall, the Woodside Nursery & Garden Center is open 7 days a week. The admission fee includes entry to the Haunted Tunnel and the outdoor "Octobercation" exhibit. On weekends, there's children's face painting and the whole family can enjoy fresh, hot roasted corn. There are activities including pumpkin picking, balloon bounce, panning for gold (! ), magic acts on weekends, and much more. In season, Benner's Farm offers pumpkin picking, a hunted hayride, farm animals, and more on their 15-acre homestead. Pick your own pumpkins straight off the vine at the Pumpkin Patch at Hank's Pumpkintown. Open weekdays, weekends, and holidays in season. There's also a maze park on weekends. The admission fee includes unlimited wagon rides, all-day corn mazes, unlimited tractor train ride, and much more. Every October, May's Farm in Wading River features pumpkin picking as well as a corn maze, pony rides, and more family fun. Check out their jams and jellies and their fresh, hot, roasted sweet corn. You can pick your own pumpkins at three Harbes Family Farm locations: At 1223 Main Road, Route 25 in Jamesport, at 715 Sound Avenue in Mattituck, and at their Middle Earth Pumpkin Farm, 5698 Sound Avenue in Riverhead. For a fee, there are hayrides at the Jamesport and Riverhead locations, pony rides at the Mattituck and Jamesport farms, corn mazes, pig races, and more.